The Apollo Edge Pro Amara Dive Gloves are a sturdy, comfortable all-round dive glove. The Apollo Edge Pro Amara gloves are a sturdy 2 mm soft neoprene glove with double thickness Amara (with polyurethane reinforcing) on the fingertips and palms. One of their main features is the extra long wrist with Velcro tabs for a secure fit and extra warmth. In order to get you the perfect glove fit, please download and print our Glove Size Chart (PDF file, 1 page, 120 Kb), which will help you to be able to get the right size. Disclaimer: The Glove Size Chart has general guidelines only. Sizes are not guaranteed. 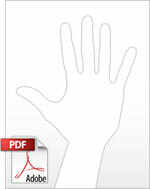 Note: When printing the PDF file, set "Actual Size", or scaling to "none", in order to get an accurate measurement.